Preheat barbecue to medium high (400 degrees). Lay out three sheets of aluminum foil, one on top of the other, folding in all four edges, to make a foil tray, about 15 inches long. Lay salmon fillets atop foil tray, leaving space between. Brush 1-2 tablespoons plum sauce over each fillet to cover. Cook on preheated grill for 6-9 minutes or until fillets are opaque and cooked through. Let rest briefly before serving. While salmon is grilling, heat olive oil in medium saute? pan until hot. Add Bok Choy and quickly stir fry until wilted. Add sweet potato medallions and let cook until lightly browned on one side and turn. Cook other side until lightly browned and top with maple syrup. Cover pan, remove from heat and let maple syrup glaze sweet potatoes briefly. Arrange a bed of Wilted Bok Choy in the center of each dinner plate. Add a serving of Maple-glazed Sweet Potatoes to each plate. 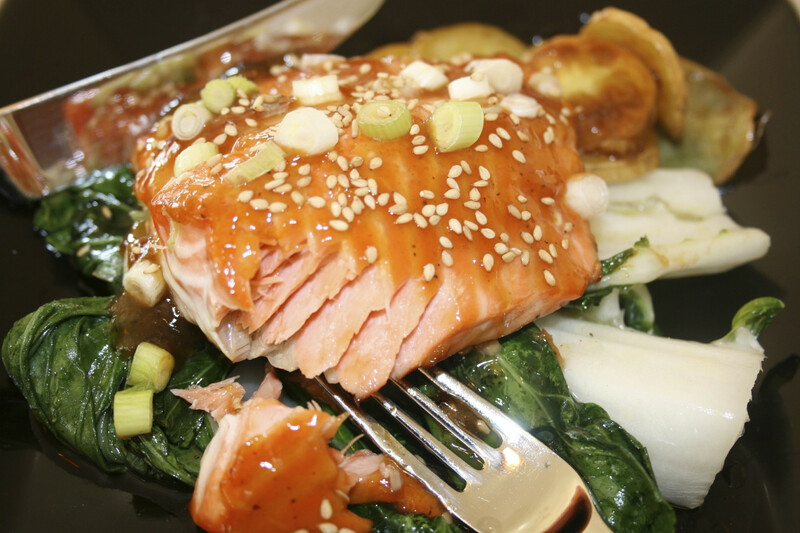 Place one Asian Grilled Salmon Fillet atop each bed of Wilted Bok Choy. Drizzle additional plum sauce over each fillet, if desired. Sprinkle sliced scallions and toasted sesame seeds over each fillet.